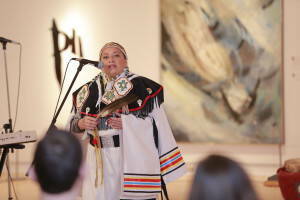 RMG Fridays: Origins reminded Oshawa and Durham Region that we live-recognize, learn from, and honour- culture. As the first event to officially begin the Robert McLaughlin Gallery’s (RMG) 50th anniversary celebrations, Origins felt more like an opening night than get-together. A nervous excitement buzzing around the main floor had managers, media, artists, and volunteers hustling to settle last minute details, and get ready for a night that would not only pay homage to the gallery’s beginnings (the building sits on recognized Mississauga territory, a branch of the Anishinaabeg Nation), but could signal a change in how Oshawa interacts with its identity . CEO of the Robert McLaughlin Gallery Donna Raetsen-Kemp, hopes people begin to see the gallery as a resource they can actively claim. “This is about connecting people (with) art and each other, (and) the gallery being (a) vehicle (for this event) is just a really beautiful example of when that happens, because this is their place, we’re here for the complete community,” she said. The night began with a special opening ceremony by cultural consultant Kim Wheatley, who is also an Anishinaabe (Ojibway) band member of the Shawanaga First Nation. Wheatley, with two of her three daughters performed a unity song with hand-drumming, the fancy shawl dance, and facilitated a dream catcher workshop respectively. Wheatley thanked RMG for involving Durham Region’s First Nations community in planning Origins. “I’m really proud of the gallery for acknowledging its Indigenous beginnings,” Wheatley said. Volunteer and community manager Carla Sinclair was also happy with how Origins was supported from beginning to end. “I’m not part of that (the Indigenous) community, so when I went to plan this event I reached out to lots of different organizations…and it was amazing how many people stepped up to the plate and were so happy to contribute (and) give advice,” she said. 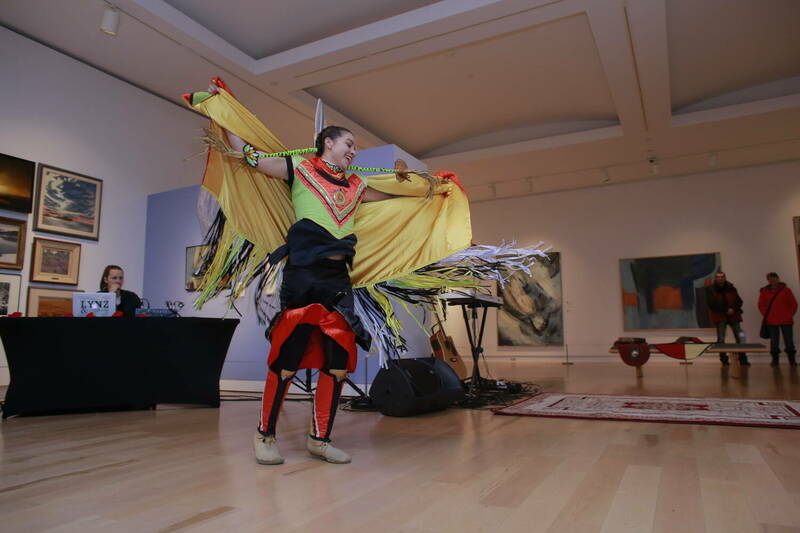 Following the opening ceremony, guests enjoyed performances by Cale Crowe and Elsa Jayne, a Pow Wow presentation, and film ‘Indigenous Arts Protocols’ by The Ontario Arts Council. Origins also hosted special community supporters like the Durham Region Metis Council, the Bawaajigewin Aboriginal Community Circle, the Aboriginal Student Centre of Durham College, and the Oshawa Community Museum. Aboriginal Student Advisor for Durham College Peggy Forbes, hopes that this specific RMG Fridays leads to representation that recognizes Canada’s multi-faceted history. “Most people don’t know about the true history of Canada-our shared history; it’s not ‘mine’ against ‘yours,’ it’s a shared history…so it’s really important that people push for more solid curriculum that includes Indigenous studies,” she said. Fortunately, the gallery plans to host future events that will showcase the many cultures that call Oshawa home. “We’re all part of this community, and unless you see yourself celebrated in them, you’re not going to necessarily feel a part of it. I absolutely think that as an art gallery, (which is) supposed to be a leader in forward thinking…in pushing the boundaries a little bit and (seeing) how the community evolves, I think it’s important to celebrate all cultures that exist in our community,” Carla said. 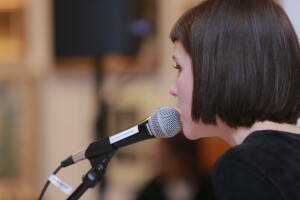 For updates on upcoming RMG Fridays visit www.rmg.on.ca, or their Facebook (@TheRMG), and Twitter (@theRMG) pages.